Loosing your internet access or having general network connectivity issues is not much fun, especially these days because most of the things you do on your computer will probably require some form of internet access. If the system has recently been infected by malicious software, this often causes at least some damage to Windows, and one of the most common problems after cleaning is that the network or internet connection doesn’t work properly. There are also other reasons why this could happen such as network related or Firewall / Antivirus software not behaving during removal. There are many parts of Windows that deal with the internet and what connects to it, so finding out yourself what’s wrong could prove an impossible task. DNS settings, IP address conflicts, DHCP service issues, TCP/IP protocol corruption, and a problem HOSTS file are just some of the things you could be trying to repair. Trying to restore your internet connection by running an internet connection repair when given the chance from within Windows might cure some problems but it’s definitely not a fix all solution..
One of the common causes of a problematic internet connection is the Windows Sockets API (Winsock) has been corrupted in the Windows registry. This service provides a communication layer between software that wants to use the internet and the traffic coming from the internet itself. And if there’s any type of problem with it, software cannot access the internet properly. Here’s a list of 7 tools that can help repair Winsock and also perform a number of other internet related repairs if the issues aren’t completely related to Winsock. Complete Internet Repair is able to fix a number of common issues that can cause anything from problems accessing certain websites or Windows Update, to a complete connection failure. Repairs include; resetting and renewing the connection, flushing DNS, Winsock repair, repairing Internet Explorer, repairing Windows Update, setting Windows Firewall back to defaults and restoring the default Hosts file. There is a brief description of what each repair does by hovering over the related icon. Simply tick the boxes to undertake multiple repairs or click the arrow icon next to the option to perform an individual repair. For best results and to hopefully not break something that isn’t broken, try only those fixes which are the same as, or what you believe to be closely related to the problem. A lot of experienced users will remember Winsock Fix because it’s one of the most effective repair tools around for some of Windows XP’s connectivity issues. It’s been a part of a lot of people’s USB toolkits for many years. If your Internet connectivity has been corrupted due to removed or invalid registry entries after the removal of malware or a problem uninstall of an application that has modified the XP network and Winsock settings, then this tool can help. What is does is reset the TCP stack, replaces all Winsock registry entries with the defaults and then replaces the Hosts file with a standard one. Winsock Fix can create a registry backup using Erunt of your current settings, which is recommended to be safe. This program is completely portable and meant for Windows 95 up to Windows XP and should NOT be used on Vista, Windows 7 or 8. WinsockReset is a valuable utility because during testing it was the only tool that could repair the Winsock if the original registry entries were completely missing by restoring the default values for whichever version of Window you’re using. Windows XP will restore these missing values with a reboot, Vista and 7 will not. Other tools or using the command line would produce an error trying to repair a non existent Winsock in the registry. 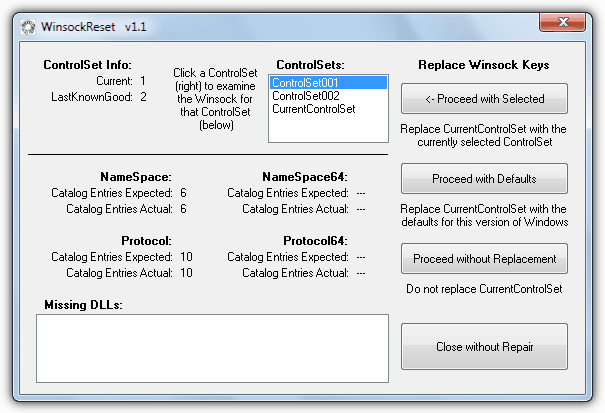 You can go directly for the CurrentControlSet in the registry and set its Winsock to the defaults for your Windows version straight away, or try to restore whatever is found in the ControlSet backups. The second option is useful if you want to try and save any registry information in Winsock from 3rd party applications. If you look at the number of Protocol entries found for any ControlSet, the minimum should be 10 and anything showing less than that has missing or corrupt entries. In XP it will also offer to replace mswsock.dll and winrnr.dl which is useful if a previous repair failed. For Vista and 7 it will use the System File Checker to replace the mswsock.dll, winrnr.dll, pnrpnsp.dll and napinsp.dll files if required. 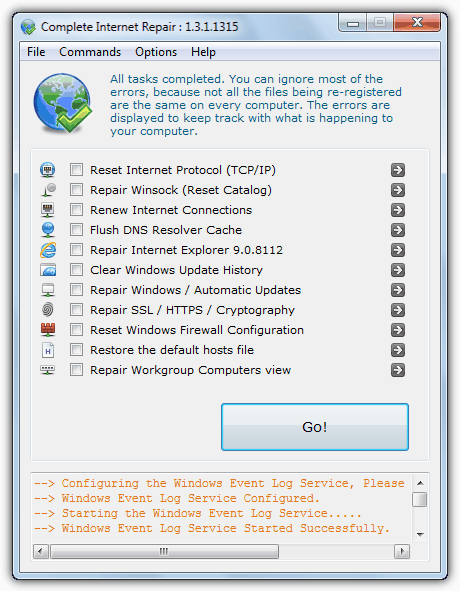 Winsockreset is a small portable tool and works on Windows XP, Vista and 7. 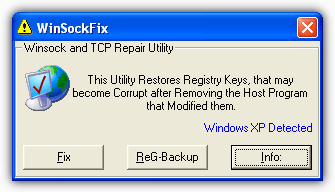 This small tool is also part of the essential Windows Repair (All In One) tool and does the simple tasks of resetting the Winsock entries in the registry and also resetting the TCP/IP stack to try and restore your internet connection to default settings. Then the DNS cache will be cleared and re-registered which is a common problem when you can’t access some websites but others are working fine. The program is small, portable and easy to use, simply press the button and in 5 seconds or so it’s done. The log window doesn’t really do much apart from show the start and finish time. Repair Winsock and DNS Cache is compatible with Windows XP, 2003, Vista, 2008 and 7. Although TCP Optimizer is primarily a tool to tweak a number of your internet connection’s settings to try and eek out that little bit more speed, it also has a couple of options to reset the Winsock and also the TCP/IP stack. Simply go to the File menu and select Reset Winsock and after accepting the warning, do the same with the Reset TCP/IP option. Then reboot the computer. Obviously it’s not recommended to play with any of the other settings in this program until the connectivity problems have been sorted out first, and then make sure to make a backup beforehand using the File menu. TCP Optimizer is a portable executable and works on Windows XP, Vista and Windows 7. 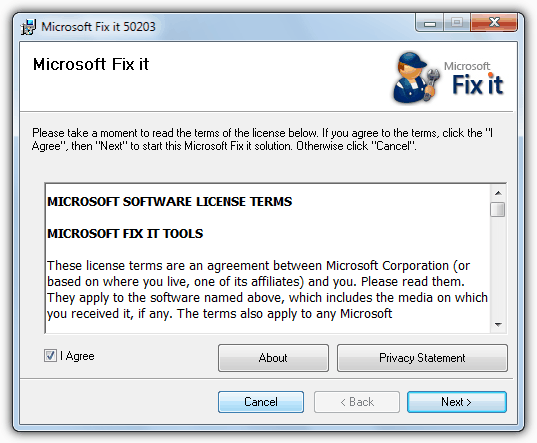 Microsoft also have their own tool for repairing a corrupted Winsock and it comes in the form of one of their Fixit tools from the Solution Center. Simply run the tool and tick the box to agree to the terms and then click next. Reboot once it’s finished. There is a Microsoft support page where you can find out more about how to manually check for Winsock corruption and also how to fix the problem the manual way as well. Although Only XP and Vista are listed in the article, Windows 7 will work as well because it behaves the same way as Vista regarding Winsock repair. This last utility is a bit different from the others in that it does need to be installed and in addition to actually fixing a number of problems, Connectivity Fixer can also actively monitor your internet connection for potential errors. If an error is detected the program will ask if you want it repaired. If you don’t want to use the monitoring function, then use the “Fix Now” button to try and repair any problems immediately. Connectivity Fixer can repair your IP, fix the Winsock, repair the DNS, repair various Internet Explorer problems and try to solve various disconnect issues. It’s not really a program you would have running all the time but is handy to use if the problems are slightly more frequent than you would like them to be. This is the free version and there is a Pro version for $10 that claims to be more advanced with better fixing capabilities. 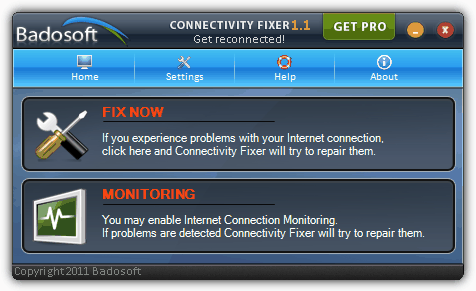 Connectivity Fixer works on Windows XP, Vista and Windows 7. Huge thanks. After struggling for almost one day to solve my fu**ing internet problem by reading and applying instructions of articles which none of them worked, I found your article with the incredible software. The first one is worked for me. Thanks 1 million times. wonderful … I have no comment to say thanks to you .. due to your tips and software information .. now my laptop is free from bad virus that hack and use my laptop and information .. Reviewing different programs to reset connectivity all for Windows 7 or earlier OS none pertain to Windows 10. I’ve spent literally two days straight trying to recover from a trojan attack which had disabled all my internet connections except those used by Firefox. It wasn’t until I found your site and the wonderful WinsockReset that I found joy! Work like a charm,made me Lol because it was silly stupid simple!!!!! It’s working perfectly on my windows xp sp3. Just run it with Windows 2000 compatibility. Just tested it on Vista Business with a working internet connection.. ICR reported no problems found, as should be..
I’ll try to play with this software and still stay away from (God forbid!) any harm that may need me to use it for its real purpose. Thanks for the info, will keep it in mind in case I encounter some problems with internet connection.